A La Bonne Franquette opened this last month in the Mount Baker neighborhood of Seattle. In fact, it is on 31st Avenue South… just up the hill from Leschi. Chef Hamed brings experience and influence from around the world to this intimate French bistro. 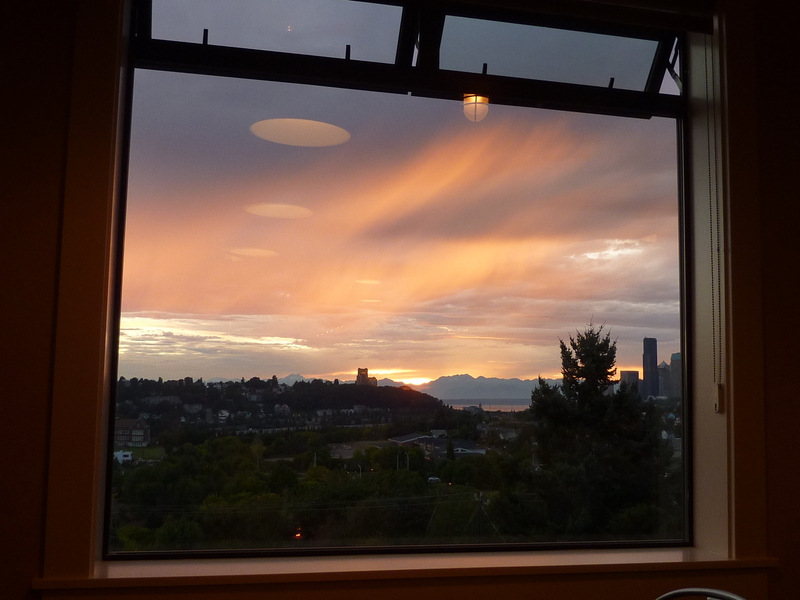 Not only is the food and ambiance a hit, you will have to check out the divine views of the Seattle skyline and Olympic Mountains. The menu here is simple yet varied, comforting, with a bit of gourmet thrown in. The food really reflects the name as A la bonne franquette means that food is homey and prepared without fuss. Check out http://alabonnefranquetteseattle.com/ for an example of their menu. I have personally sampled the majority of the menu. Try the Assiette de Fromages, Pate, or others to start. As a side (or make it your main course), the Gratin de Pommes de Terre…Gruyere cheese potato gratin (so good!). 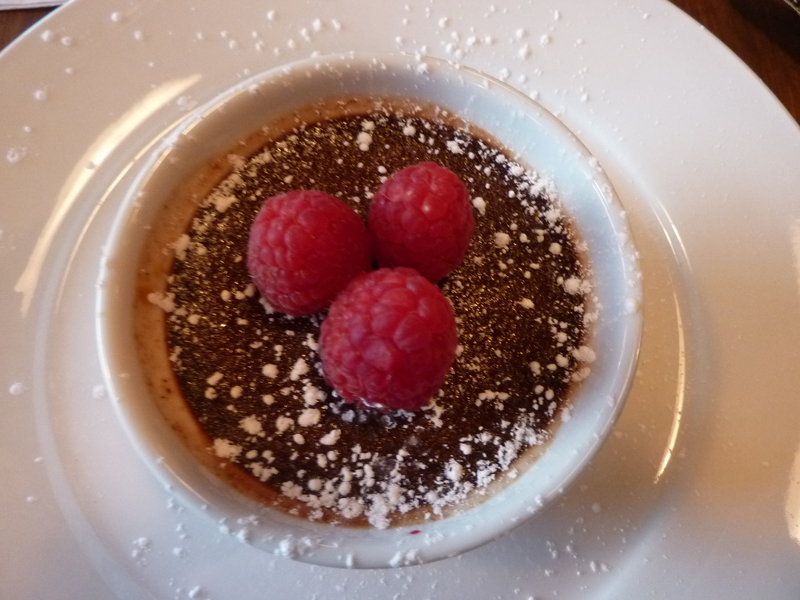 And save room for dessert… I am not a creme brulee fan typically, but this is indeed the best I have had. Also, try the Pot de Creme de Chocolat (a rich chocolate mousse). There are daily specials and they have a nice wine selection, a mix of French and Washington wines. Bring your friends, drink a drink, taste the flavors! Hours of operation are Tuesday through Saturday, 5 pm – 10 pm. Walla Walla, WA! Check out previous posts from February 2011 and October 2010. Consider this an update as I found some changes in downtown Walla Walla. Some of the long time merchants have closed or are closing, including Willow. There are also a number of welcomed arrivals – Public House 124, Green Spoon, and Kerloo Cellars tasting room. Walla Walla’s Farmers Market was in full swing this September weekend. I purchased a number of photo cards that represent the beautiful work of J. Franklin Willis http://www.jfranklinwillis.com/index.php. I particularly like the barn and farm scenes. Kerloo Cellars has been added to my favorites list. A welcome addition to the Walla Walla wine community, making great tasting artisan wines. http://kerloocellars.com/club. Visits were made to some of my faves like Walla Walla Clothing Company, Sinclair Estates, Trust, The Marcus Whitman (ladies, you will love the full length mirrors), Five Star Cellars, and Kontos. Oh, and I must give a shout out to the gift shop/lobby area of Three Rivers Winery. Also, a tour and tasting (by appointment only) at Long Shadows www.longshadows.com. Long Shadows is a real treat…personalized service, top-notch wines, and a state-of-the-art winery. A Dale Chiluly glass chandelier hangs in the lobby as well as other pieces throughout the tasting room. Allen Shoup, one of the founding fathers of the Washington Wine industry and founded this winery to showcase Washington wines to the rest of the U.S. as well as the world, by bringing in great winemakers from all over the globe. Long Shadows has nine wine makers making six different main wines – Poet’s Leap Riesling (Armin Diel), Pirouette (Philippe Melka, Agustin Huneeus), Chester-Kidder (Gilles Nicault, Allen Shoup), Saggi (Ambrogio & Giovanni Folonari), Feather (Randy Dunn), Sequel (John Duval) and Pedestal(Michel Rolland). I was fortunate to have met both Gilles Nicault and John Duval (John was here from Australia selecting the grapes for this year’s Sequel) – both gracious and inviting. 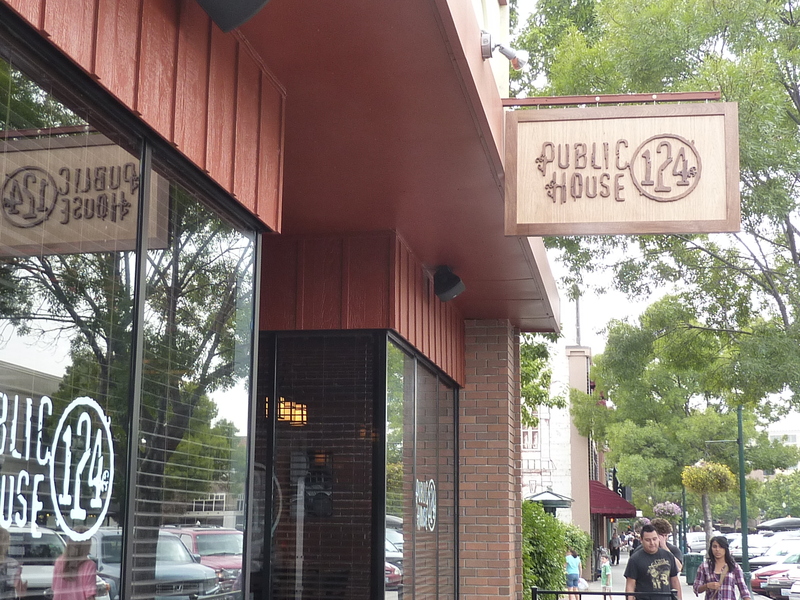 Public House 124 – ooh la la. We happened along this find while searching for what suited our taste buds and desire for a more easy-going evening out. We found it to be a great place to socialize, eat, drink, and enjoy the Walla Walla scene, whether they were locals or visitors. The stylish decor is inviting and warm, with the brick walls, fireplace, variety of seating options, open kitchen, and TV’s at the bar for viewing. An outdoor patio is a nice addition during good weather. Public House 124 has a nice selection of cocktails and beer assortment. The menu is a blend of small plates, sandwiches, and a few entrees thrown in. The Pork Shoulder Torta was shared (with fries). The starters included the special, tangy Korean Chicken Wings with Asian Pear Salad (Slaw). So scrumptous, especially the pear slaw. And the Scallion Crepes (almost like a wrap), included Peking style roasted chicken, cilantro, shaved Walla Walla sweet onion, and a flavorful hoisin sauce. Highly recommended with a gracious and pleasant staff taking care of your needs. The Des Moines Rotary presented the second annual Poverty Bay Blues & Brews Festival, September 10th at the Des Moines Beach Park. Also, on this day, the Des Moines Farmers Market and Poverty Bay Arts Festival took place. Come rain or shine. Blues? they got it! Brews? they got that too! This year’s line up was Little Bill and the Bluenotes (excellent!!! ), Rod Cook and Toast, Fabulous Roofshakers, and Left Hand Smoke. Breweries participating were Odin, Big Al, Hood Canal, Harmon, Elliott Bay, Airways, Stone, Scuttlebutt, Georgetown, Fish Brewing, and M.T. Head. Masset Winery poured two varietals. My favorites (based on what style was being served) were M.T. Head and Fish Brewing Company…especially Reel Ales Starfish Imperial Red Ale and Spire Mountain Apple Cider. This was a nice event to try new styles and breweries. Check out http://www.dmrotary.org/events.php for a list of sponsors and more event info. No pets. Age 21 and over. Free Parking. Bring your chair and/or blanket. Located near the beautiful scenery of the Puget Sound. Proceeds benefit Highline Music 4 Life. http://www.highlinemusic4life.org/. Do you know what a Bumbershoot is? it is an umbrella. 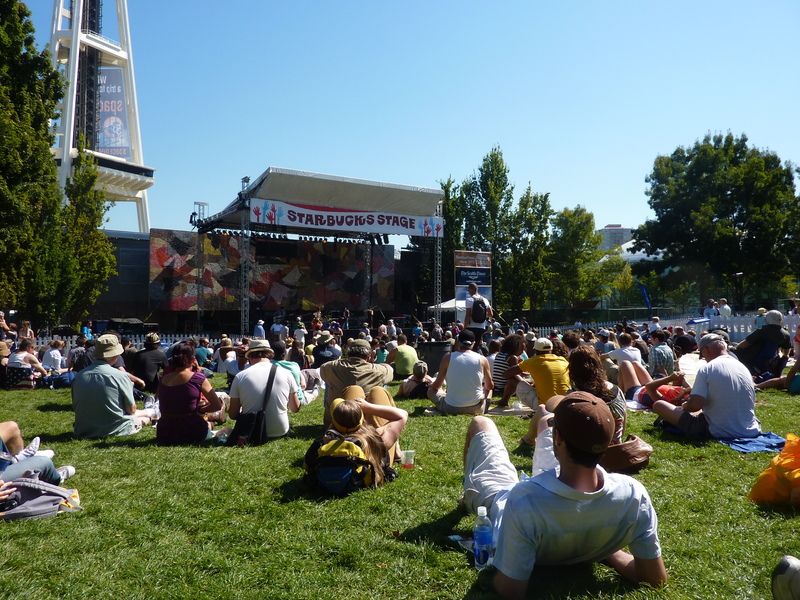 Seattle hosts (and One Reel organizes) this an annual three-day music festival on Labor Day weekend called Bumbershoot…which lists both local and international acts. It is located at the Seattle Center, which has the grounds and venues to carry it off. The format changes a bit each year. 2011 was more indie focused with less well-known (but high quality) acts. The headliner for Monday, Labor Day was Daryl Hall and John Oates. This year, for the first time, Bumbershoot hosted Youngershoot…activites and music for the family. There is also art, film, and of course, food. 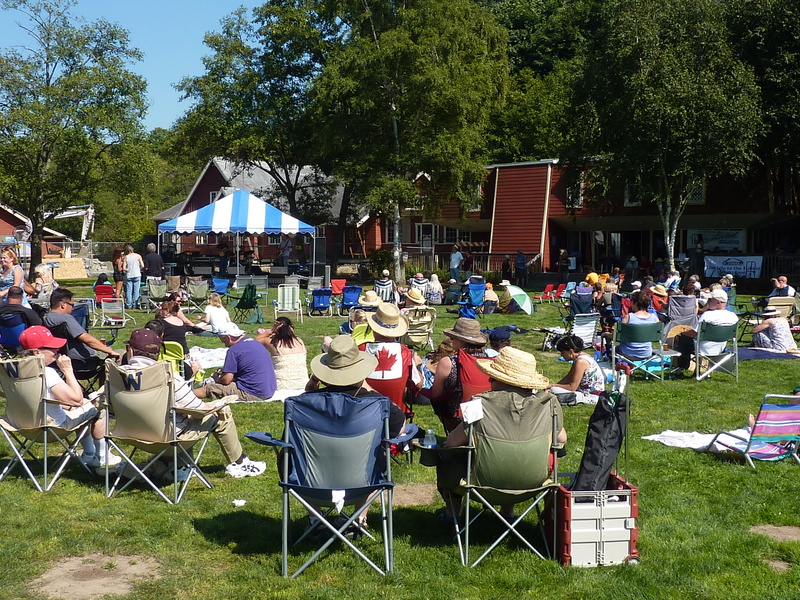 The type of music often depends on which stage they are performing on…whether it be the Starbucks Stage , the Fountain Lawn Stage, the Fisher Green Stage, the EMP Level 3 Stage, the Exhibition Hall, the Intiman Theatre (comedy), or the Bagley Wright Theatre (dance, theater)… and others. Most stages has its own sponsor. The Key Arena hosted the mainstage acts. I was able see a variety this year… the Trey McIntyre Project, Legendary Oaks, Quadron, Wayne Federman and The Gregory Brothers, Dennis Coffey, Charles Bradley, Fitz and the Tantrums, and part Daryl Hall and John Oates and The Reverend Horton Heat. All were great choices and I’d have to say my faves were Dennis Coffey (funkn’ it out), Charles Bradley (the Screaming Eagle of Soul), and Fitz and the Tantrums. That is what is interesting (and fun) about Bumbershoot, there are so many genres and options. There are so many choices, that you undoubtedly miss those you wish you could have seen too, especially if you only go one day. You could certainly enjoy something each day of the festival. You can bring your own chair and food in, which is helpful if you’re there for all day, which you should be! Park across the street and you’ll have access to your vehicle without much trouble. This year mind you we had 80 degree weather… but whether rain (Bumbershoot needed) or shine, you’ll have a good time and see a band, comedy act, dance troupe, or other that you haven’t seen before. If you didn’t get to it this year – maybe try it next year! Cool! A day spent visiting places or seeing things beginning with SEA. The Seattle Art Museum, Seatown, and the Seattle Seahawks! 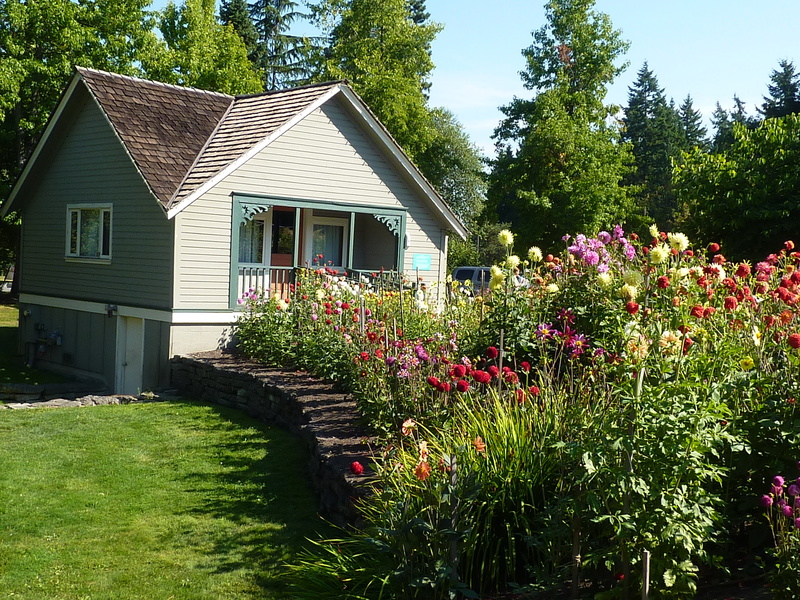 Bellevue Botanical Garden’s second annual Art in the Garden was August 26-28th. It was a nice location for such an event as there is plenty of space for the showing of mosaics, ceramic luminaries, cast iron and steel sculptures, cement leaves, and copper water features, among others. The price range for most of the outdoor art was $50 – 1000’s (with a few less than). I especially liked Aiko Vail/Poul Erickson’s fused glass as well as Alison Hoagland’s blown glass garden ornaments. Another favorite was John Daoura’s wine barrel furniture (Dakota Craftworks) – the quality is apparent in these pieces, whether it be the chair, table, or other. The chair has a space for a wine glass too.